A confused weather situation should bring easterlies to most of the North Island on Friday, followed by light to moderate westerlies on Saturday and stronger northwesterlies for Sunday and Monday. For the top of the South Island winds should be northerly on Saturday and strong northwesterlies should become established by Sunday. Easterlies or southeasterlies should prevail over the south of the South Island for the weekend. By far the best catch report we have had for weeks. Alan Breckon, a keen kitefisher and newsletter subscriber, phoned me to report on a most outstanding kitefishing trip to Bayly's Beach, Dargavile just three weeks ago. Alan set just 23 hooks, baited with salted mullet, on his bottom longline rig and he certainly didn't need to do more than one set. After leaving the gear to fish for only 20 minutes Alan pulled the gear back in. The catch was unbelievable! He hauled in 17 snapper up to 22 lbs with several of them around the 15 to 18 lb mark. This must be one of the three outstanding catches in the area we reported two or three weeks ago but had no first hand details for. There were quite a few other kitefishers doing really well on the beach this particular day. If you are one of them how about sending in a report or giving us a call on 0800-115-483. Did anyone have a camera on hand this day? We would love to get some photos for this newsletter. Ephram Kemp shows off a magnificent Port Waikato catch taken on one set with a Paul's Fishing Kites bottom longline rig on July 12, 1991. The biggest snapper was 33 lbs and the second heaviest was 29 lbs. The total combined weight of the 6 snapper was 119.5 lbs, so they very nearly averaged 20 lbs each. It's very rare for big fish like these to school together, but obviously there was a school of them off Bayly's Beach recently. On Thursday the 20th of June the wind went easterly for the day. I had my gear already packed and headed out to Muriwai Beach. The wind was howling, I reckon it would have been 70 to 80 knots. At first we thought it would be too much for our Nighthawk kite, but there was no way we were going home without trying to get a set out. First we put the Nighthawk up with a 10mm spar and ran the line out to the bottle cord. As soon as we stopped the reel to put the bottle on, the tension came on and the 10mm spar broke! We were not going to give up! We then taped two 10mm spars together with electrical tape and this did the trick. We quickly set 25 hooks on our bottom line to 1500 metres offshore and left it fishing for 45 minutes. We caught two really BIG sharks and lost 8 hooks to shark bite offs. We had a really hard time pulling our line in. It had taken a 4 litre oil bottle full of sand with two 10 oz sinkers hung off the bottle just to keep the bottle down on the water. I would not recomend this way of fishing with a kite. We watched a couple of other kitefishers as they broke their spars and packed up and went home Perhaps we should have done the same? But, on the other hand, we were out there fishing and that made it a good day. Is there anyone that receives this newsletter that lives on a beach suitable for kitefishing that I can call or e-mail to find out which way the wind is really blowing. I have found that you can't always count on the weather forecast. Well it's been a bit of a mixed bag here over the last week, the wind got up from the west and the sea dropped off from the south. I have had three reports come in over the last week. A kayak fisherman who runs a boat longline was fishing just south of Blackhead Lighthouse and caught 20 plus good sized gurnard, a few rig (spotted dogfish) and no spiny dogs. Another report from the Porangahau River mouth was from a kontiki fisher who also managed 20 plus gurnard and kahawai and again reported no spiny dogs. Local kitefisher Trev Sciascia fished his Paul's super kite and longline most days over the last week. He has been recording very good catches of gurnard, using salted bonito as bait and is catching none of the dreaded spiny dogfish. Hopefully the spiny dogs have gone for this year! Not many people know that the Blackhead Lighthouse beach is ideal for the north to northeast winds expected this weekend. If you head out that way just remember to keep south of the point and away from the rocks if you are using a longline. At the lower end of the tide you could use a dropper ledger rig off the rocks as the rock shelf drops straight down to about 20 metres. This area is ideal fishing for kingfish. While in this area another good fishing spot, snapper rock, lies just north of the river mouth in the 21 metres of water. It got it's name from the many big snapper that have been taken there over the years. I also had a report from our commercial cray boys that they pulled one of their pots up on Monday and found a very large half eaten snapper in it, so it does show that the snapper are still around. Our kahawai fishing contest is now under way so don't forget to weigh in your kahawai catch at the shop. Snapper are still in close in the far north of the country. Alison from Stephens Sportsworld in Kaikohe reports the east coast fishing has been good for snapper. There have been very few fishing opportunities on the west coast due to the weather recently. Home Point and Matai Bay are two places Stephen from Stirling Sports has been fishing recently. Stephen is a keen kayak fisherman and has been landing his bag limit of snapper easily. After fishing for an hour and a half at Matai Bay, Stephen and his friends had to stop fishing, as they could not find any room in their kayaks to fit anymore fish. Fishing from the shore is still good around the Whangarei area. Stephen reports snapper up to 6kg have been landed off the rocks on the east coast. Kingfish have also been around in abundance, the best fish landed lately weighed in at 26kg. The snapper seem to have moved out on the west coast but there have been very few chances for the fishermen to get out recently. Lots of snapper, gurnard and trevally are in close just behind the breakers off Ruakaka beach according to Warren from Dargaville Marine. This could be a good place for all those wanting to go kitefishing this weekend. Surfcasting from Grahams Beach has been producing good gurnard and kahawai for the past few weeks. Pat from Auckland Fishing Tackle has been out there the last two weekends and has had no problem bringing in a bag of fish. The trevally in the Manukau have finally moved out. Having a few hours out in the dinghy last weekend produced only one trevally. We will probably give the fishing a miss for a few weeks; at least until the scallop season starts in July. Fishing around the Coromandel is going well. Mike from Fish City Hamilton advises the snapper are on both sides of the peninsula. Barracuda are more of a problem on the Bay of Plenty side but straylining seems to be the most effective way to target the big fish. Further down the country fishing has been difficult. 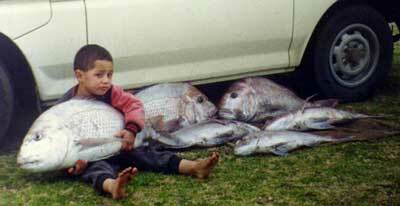 According to our reports the Whakatane area is not producing many fish.